This article is about Donkey Kong's appearance in Super Smash Bros. Melee. For the character in other contexts, see Donkey Kong. Donkey Kong (ドンキーコング, Donkey Kong), shortened as D K on the victory screen and character select screen, is a default character in Super Smash Bros. Melee. He returns from the original Super Smash Bros., but with faster moves and agility, as well as an improved recovery. He is currently 17th out of 26 on the tier list, placing him in the E tier. This is a slight improvement to his previous placement in Smash 64 where he was ranked 9th out of 12. Donkey Kong, true to being a heavyweight, is difficult to KO, and this is aided by his fast falling speed. Donkey Kong also has powerful attacks, and he has excellent range to boot. Despite his weight and size, Donkey Kong is very agile; most of his attacks are executed swiftly, he has a high air speed, and his jumping prowess is solid. His mobility facilitates combos, and this is further aided by his remarkable grab. However, Donkey Kong himself is vulnerable to combos due to his large size, and his recovery, while covering a significant amount of horizontal distance, struggles in terms of vertical distance. Due to these traits, Donkey Kong is seen as a situational character. Contrary to what his archetype might suggest, Donkey Kong has surprisingly high speed for a character of his power and weight class. In raw characteristics, Donkey Kong owns a fast walking speed, an above-average running speed, a high air speed, and a high falling speed (though unlike other high-fallers, Donkey Kong's gravity is average as opposed to above-average, with him having the lowest gravity value amongst the high-fallers; he shares the same fall speed as the significantly lighter Roy), aspects that lead to a short wavedash, but an average SHFFL, and long, safe dash dance. Owing to his relatively high speed, Donkey Kong owns a flexible, powerful comboing game. On the ground, Donkey Kong's various tilts are all fast and can be used to start aerial combos, and in the air, Donkey Kong's fast, low-lag neutral, up, and back aerial attacks can allow him to continue attacking enemies with little penalty against him; adding to this, his high air speed can allow him to pursue enemies that have been popped up into the air. Arguably his most important combo tool, however, consists of his throwing game; despite a below-average grab range, Donkey Kong's various throws have low-knockback and low ending lag, making them excellent combo starting tools. His forward throw, known as the "cargo throw" or "cradle", is especially useful, due to its ability to easily combo into his practical air options. While carrying his opponent, Donkey Kong is free to move around the stage, allowing him to move to areas where he can more easily combo his opponents without interference from platforms or other hazards. He can also use this feature of the cargo throw to either perform a sacrificial KO by walking off the edge of the stage after cradling an enemy or throwing the enemy underneath the stage to stage spike them. As expected for a character of his weight class, Donkey Kong also has a plethora of powerful attack options in addition to his faster, weaker offerings. All of his smash attacks can cover significant distances away from him, as well as packing significant power in order to KO opponents. Three of his aerials (back, down and forward) can be potent finishers to complement his aerial game, and his Giant Punch can easily be one of the most powerful attacks in the game if landed, though it does require a particularly good read or combo in order to be most effective. Due to being a heavyweight with a high falling speed, Donkey Kong owns a below-average recovery. While these traits make Donkey Kong highly resilient to the upper blast line, Donkey Kong's survivability on all other blast lines is poor. Spinning Kong grants above average horizontal distance, but poor vertical distance, making meteor smashes and spikes extremely powerful against Donkey Kong. Owing to a lack of other options concerning his recovery, this also means that he has very poor recovery options compared to other characters; none of his specials can reduce his falling speed, and he cannot wall-jump or use any other tactics in conjunction with Spinning Kong, and as such, the character is simple to edgeguard. Much like fellow heavyweight Bowser, Donkey Kong's various attributes also make him very easy to combo. In addition to having among the largest raw hurtbox sizes in the game, Donkey Kong's high falling speed and weight make it easy for characters to chain throw him, as well as combo him in the air. Compounding this is Donkey Kong's poor defensive game; a large hurtbox causes him to have a small shield that can easily make him vulnerable to shield stabbing, and his lack of a projectile can prevent him from easily approaching enemies that own one. Donkey Kong has received a large mix of buffs and nerfs in his transition from SSB64 to Melee. However, whether he was buffed or nerfed overall is debatable since the nerfs and buffs he receieved were both significant. While he has lost his previously abusable grab release, the generally faster falling speeds have given DK a new type of chaingrab against fast-falling opponents, particularly with his newly buffed cargo throw, and his new up and down throws. However, his reach has been reduced (though it remains among the best) and his power is lower as well, but many of his attacks are faster to execute. He is also more vulnerable to combos due to his faster falling speed and his overall endurance is much worse due to him being much lighter. Regardless, Donkey Kong ranks better relative to the cast in Melee than he does in SSB64, now ranking 17th out of 26 characters rather than 9th out of 12 although he struggles even more against the higher tiered characters resulting in him being considered an unviable pick for competitive play. Donkey Kong's hair color on his default costume is now a darker shade of brown. His other costumes have different ties to them (black has blue; red has a slightly darker blue than the black costume; blue has purple; and green has a red tie that is very similar to the original costume, but is a little darker). The voice clips when Donkey Kong taunts and is KO'd in SSB are switched in Melee. His voice clips are also retained from the previous game, though with better quality. Donkey Kong always faces the screen when he taunts, regardless of which direction he is currently facing. Donkey Kong's green alternate costume is now available for Free-for-all, instead of being exclusive to Team Battle. The costume also uses his normal skin color, as opposed to being green like in SSB. Donkey Kong has a new helpless animation. Donkey Kong's air speed is faster (30 → 1), going from average in Smash 64 to among the faster air speeds in Melee. His attacks are generally faster. Donkey Kong can throw heavy items (Crates, Barrels, Barrel Cannons and Party Balls) above and below him, which he could not do in Smash 64. He also walks slightly faster and gains small amounts of armor when carrying them. Donkey Kong walks significantly faster (0.32 → 1.2), going from the 3rd slowest in SSB to the 6th fastest in Melee. Donkey Kong dashes faster (48 → 1.6), now having the 10th fastest dashing speed in Melee. Donkey Kong is catastrophically lighter (141 → 114), which drastically hinders his endurance, while still being just as vulnerable to combos as before due to his increased falling speed. His attacks are generally weaker, such as his forward smash. Donkey Kong's falling speed has significantly increased (56 → 2.4). With the introduction of the SHFFL technique, he can make strong use of the technique due to his falling speed. His falling speed also makes him considerably more vulnerable to combos and worsens his already poor vertical recovery. Considering that Donkey Kong's vertical endurance hasn't significantly improved from Smash 64 due to his significantly lighter weight in Melee, this falling speed increase does more harm than good. Donkey Kong can no longer avoid projectiles from hitting his head by taunting. Donkey Kong's new ground release animation is 9 frames shorter compared to the rest of the cast, giving him more time to counterattack. Donkey Kong's short hop is lower. Donkey Kong can now glide toss although his glide toss is fairly short. Neutral attack now has a wider hitbox. The second hit also has less startup lag and a longer duration (frames 6-11 → 5-11) and does 2% more damage (4% → 6%). The first hit of neutral attack has a shorter duration (frames 5-8 → 5-7). The second hit has slightly higher ending lag (frame 34 → 35). Donkey Kong has a new forward tilt an open outward hand swat that can be angled. It has less startup (frame 12 → 8) and ending lag (frame 43 → 34) compared to his old forward tilt. New forward tilt deals less damage regardless of tilt direction (12% → 11% (angled up), 10% (default), 9% (angled down), hindering its KO potential. It also has a shorter duration (frames 12-17 → 8-11). Up tilt has less ending lag (frame 60 → 40). Up tilt has more startup lag and a much shorter duration (frames 4-23 → 6-11). Down tilt has less startup (frame 11 → 6). Down tilt has a shorter duration (frames 11-16 → 6-9) and has more ending lag (frame 22 → 24). Down and up tilt both deal less damage (8% → 7% (down tilt), 13% → 9% (up tilt). Dash attack has less ending lag (frame 71 → 55). Dash attack has more startup lag and a shorter duration (frames 3-26 → 9-20). It also deals less damage (12% → 11% (clean), 9% (late). Donkey Kong has a new down smash: He holds up his arms and punches downwards in a 90° angle, with a sweetspot hitbox located in his hands. It has less startup (frame 12 → 10) and ending lag (frame 70 → 56) and has more base knockback (30 → 35) than his old down smash. New down smash has a much shorter duration (frames 12-31 → 10-13), now has sourspots and deals less damage (19% → 16%/14%). Donkey Kong has a new forward smash: Donkey Kong performs a powerful clap in front of him. It has less startup (frame 27 → 22) and ending lag (frame 60 → 55). New forward smash has less reach and knockback (20 (base), 100 (scaling) → 22/90) than his old forward smash. It also has a shorter duration (frames 27-32 → 22-23). Up smash is faster in both startup (frame 16 → 14) and ending lag (frame 60 → 54). Up smash can no longer hit grounded opponents when standing on a flat surface and it deals less damage (21% → 18%) and has decreased knockback scaling (100 → 93) hindering its reliability and KO potential. Neutral, forward and down aerials all auto-cancel later (frame 29 → 39 (neutral), frame 35 → N/A (forward), frame 29 → 50 (down)) and can no longer auto-cancel in a short hop. Back and up aerials auto-cancel earlier (frame 35 → 20 (back), frame 20 → 13 (up)). Neutral aerial has less ending lag (frame 60 → 39). Damage output in the early and late hits of neutral aerial are changed (15% → 12% for the early hit, 9% → 10% for the late hit). Neutral aerial has more startup lag and a shorter duration (frames 4-29 → 10-26). It also deals less damage (15% → 12% (clean), 12% → 10% (late)) hindering its KO potential. Forward aerial's sweetspot has more base knockback (0 → 30 (clean)) making it more effective at lower percents. His forward aerial and down aerial have much slower start-up (frame 8 → 25 (forward), frame 6 → 18 (down)) with the former having decreased knockback scaling (100 → 85). Additionally, the latter's hitbox length was shortened. Forward aerial also has much more ending (frame 50 → 60) and landing lag which is exacerbated by the weakening of L-canceling. Lastly, both aerials have altered angles (-70° (forward), -90° (down) → 270° (both)) resulting in them suffering from the introduction of meteor canceling hindering their reliability. Donkey Kong has a new back aerial, he kicks backwards with his right foot. It has slightly faster startup (frame 8 → 7), and much less ending lag (frame 60 → 32). It also deals more damage on both the clean and late hits (12% → 13% (clean hit), 8% → 9% (late hit). Back aerial's hitbox length has been slightly shortened. It also has a much shorter duration (frames 8-35 → 7-15). Donkey Kong has a new up aerial: a swinging headbutt similar to Ness' up aerial. This new up aerial has less ending lag (frame 60 → 38) and has better comboing and KO ability due to hitting above him sooner and deals 2% more damage (12% → 14%) and has increased knockback (0 (base), 100 (scaling) → 30/90). His new up aerial has less reach, more startup lag and a much shorter hitbox duration than his old up aerial (frames 3-20 → 6-8). Donkey Kong has a new down aerial: he slams down his right foot. Down aerial deals 3% more damage (13% (clean), 10% (late) → 16%/13%), has increased base knockback (15 → 38/20), more range and has a consistently powerful hitbox, due to the removal of the late hit. It also has less ending lag (frame 60 → 55). Down aerial has a much shorter duration due to no longer having a late hit (frames 6-29 → 18-23). Despite the removal of the late hit, down aerial still has a weaker sourspot which is situated on Donkey Kong's body. As with all returning veterans, DK now has a pummel, up throw and down throw giving him more options out of a grab. His grab range was reduced, going from the longest non-tether grab in Smash 64 to below average in Melee. His grabs have more startup lag (frame 6 → 8 (standing), 10 (dash)) and ending lag (frame 16 → 31 (standing), 41 (dash)). Forward throw can now throw up and down, giving DK more options to combo or KO. Donkey Kong will take 10% damage if the opponent escapes from his forward throw. Forward throw no longer deals damage when lifting the opponent, but the opponent will take 4% more damage if they break free from Donkey Kong's forward throw (6% → 10%). Cargo forward and back throw deal more damage (6% → 8% for (Cargo forward throw), 7% → 8% for (Cargo back throw). Cargo forward and back throw deal less knockback (70 (base), 80 (scaling) → 80/50). Back throw does 8% less damage (18% → 10%) and knockback (80 (base), 70 (scaling) → 60/65) hindering its KO potential. Edge attack when below 100% deals 2% more damage (6% → 8%) and can now hit opponents that are standing directly near the ledge. Edge attack when below 100% has slightly less range. Edge attack when above 100% has slightly faster startup, more range and deals 4% more damage (6% → 10%). Giant Punch charges faster (139 frames → 127), has a new hitbox behind his arm which deals vertical knockback and has less startup (frame 23 → 17) and has much less ending lag (frame 94 → 47). Its uncharged variant also has higher base knockback (0 → 15) which compensates for each charge level dealing 2% less damage. The 10th charge level now deals the same amount of damage as fully charged Giant Punch and it has higher knockback than its fully charged variant. Giant Punch has less reach, deals less damage (12%-32% → 10%-30% (uncharged) 36% → 30% (grounded fully charged), 27% (aerial fully charged), and its fully charged variant deals lower knockback (0 (base), 100 (scaling) → 10/90). It now also leaves him helpless when used in the air, which, combined with his poor vertical recovery and the move's lower power, weakens its offstage utility. Fully charged Giant Punch also no longer deals extra shield damage and its back hit is drastically weaker than the front hit. Giant Punch now has a new animation: Donkey Kong winds up his fist back instead of merely behind himself, and now performs the attack with his left arm. Donkey Kong now has a side special: Headbutt. It can bury grounded opponents, meteor smash aerial opponents and also does very high amounts of shield damage. Spinning Kong now goes a slightly longer distance and the grounded version can now KO due to no longer having set knockback. It also has less ending lag (frame 100 → 85). When Donkey Kong is spinning during the move in midair, he can also grab ledges from behind, which he could not do in Smash 64 which significantly improves his recovery. The move also does 21% more damage when used in the air (12% → 33%) and has less startup lag (frame 3 → 2). Spinning Kong has less intangibility (frames 1-5 (both) → 3-5 (grounded), 2-5 (aerial)) and aerial spinning Kong has less invincibility (frames 9-48 → 11-42). Additionally if he is hit out of Spinning Kong, he will now lose the charge for his Giant Punch. Hand Slap deals 1% more damage (10% → 11%), has slightly more power, slightly higher range and less start-up. Hand Slap has 20 frames of ending lag as opposed to being lagless in Smash 64. Hand Slap has a new animation: Donkey Kong now alternates slapping the ground with each hand without hopping, instead of slightly hopping and successively slapping both hands onto the ground as he did in SSB. Like some other characters, Donkey Kong was slightly altered in the PAL version of Melee. Donkey Kong received one beneficial change although it is not enough to drastically improve his competitive viability. If Donkey Kong is hit of of Spinning Kong, he will no longer lose the charge for his Giant Punch. For a gallery of Donkey Kong's hitboxes, see here. 4% Performs a quick cross punch followed by an uppercut. 11% Quickly swats his outstretched hand. A good move for spacing. Can be aimed up or down. 9-11% Quickly swipes his hand in the air. A decent juggling move. Slouch Slap 7% Quickly swats his hand across the ground. Very fast with long range. 11% (clean), 9% (late) Skids to a halt and does a side-kick. Has high ending lag and surprisingly short range. 20% (hands), 21% (arms), 19% (upper body), 18% (lower body) Performs a very forceful clap that deals high knockback. Somewhat fast. 18% Claps both his hands above his head, dealing good knockback. Somewhat slow, not to mention this will not hit a grounded foe at all. DK's head and both of his arms are intangible while the hitboxes are active. 16% (hands), 14% (arms) Does a double back-handed punch by bringing both his fists down 90˚ at both sides. Very fast and deals great vertical knockback. 12% (clean), 10% (late) Quickly spins in the air with both of his arms extended. Has quick startup and small ending lag. 16% Puts his fists together above his head, then does a powerful ax-handle swing downwards. This move can meteor smash opponents the moment Donkey Kong swings his hands in front of his face. Resembles his midair attack from Donkey Kong 64. 13% (clean), 9% (late) Performs a quick kick directed behind him that lingers briefly. A good edgeguarding move. 14% Performs a quick headbutt upwards. Combos into another up aerial. Has a large autocancel window. 16% (foot), 13% (body) Performs a downward stomp whilst holding his arms up in a macho pose. A meteor smash. 3% Karate chops the foe. Kong Karry 10% (breakout), 8% (forward/backward), 7% (up), 6% (down) Regardless of the opponent's size, DK heaves the opponent onto his back. Then, he can perform any of the following throws listed below. One side note is that Donkey Kong will receive 10% damage if the opponents breaks free of his grab by button mashing. Back: Tosses opponent behind him. Up: Tosses opponent upwards. Can chain grab fastfallers. Down: Tosses opponent like a bowling ball. 11% Swings his arm back and throws the opponent behind him. 9% Throws foe upwards with one hand. Can chaingrab fastfallers, much like his cargo up throw. 7% Violently slams the opponent into the ground with one hand. Can chaingrab. 6% Gets up and swats both sides of himself. 6% Jumps on both his hands and kicks backwards then forwards while getting up. 8% Throws his rear at the opponent. Has huge range for a ledge attack. 10% Climbs onto the stage and swats forward. Giant Punch 12% (uncharged), 18%/30% (fully charged ground), 16%/27% (fully charged air) Donkey Kong winds up and thrusts out his arm as a potentially powerful attack. He can swing his arm up to 11 times, with each swing adding 2% damage. The attack itself has good range and decent speed. Donkey Kong will become helpless whenever he unleashes the punch in the air. Headbutt 5% (ground), 10% (air) Donkey Kong slams his head downward. When performed on the ground, the opponent is buried and will remain submerged the more damage the opponent has taken. When performed in the air, this attack becomes a meteor smash. This attack can also be used to quickly break shields. Air: 10% (startup), 4-5% (loop early), 2% (loop late) Donkey Kong twirls around like a helicopter, hitting multiple times. Has great horizontal coverage, lacking vertical distance. DK's arms are intangible during the first half of the move when used in the air. Hand Slap 11% Donkey Kong delivers an earth-shaking blow to the ground, sending nearby enemies skyward. It has considerable power, consistent and repetitive damage, and a large quake hitbox. This attack has transcendent priority and will only hit grounded opponents. Looks at the camera, shrugs his shoulders, and then makes a confused noise. A flourish originating from Donkey Kong Country that played whenever a Kong defeated a boss or completed a bonus level. Does a backflip, flexes his biceps and roars. Waves his hands in a fist over his head. Beats his chest and grunts. Donkey Kong has an above-average matchup spread for his tier. He is countered by 5 characters, soft-countered by 5 (including Mewtwo, who is ranked lower than DK), has 4 even matchups, counters 6, and soft-counters 5. DK does rather well against characters who can be comboed with ease, such as Bowser and Samus, and characters who have poor range/survivability, like Zelda and Pichu. However, DK struggles against characters with powerful comboing tools, edgeguarding options, and characters who have access to chaingrabs against him (Sheik is very notorious in all 3 categories). Pretty much every character in the top/high tier have tools to compete with DK efficiently, which is a problem. Characters like Fox and Falco can easily combo and edgeguard DK into an almost-guaranteed death, and others like Sheik and Ganondorf can chaingrab him to very high percents into a KO (sometimes zero-to-death). In the end, DK has some decent advantages, but also notable disadvantages to mitigate the positives, which results in DK being an overall situational character with low tournament representation and results (despite his above average matchups). In the current metagame, it is unknown how well Donkey Kong's matchups are. Several characters above him - namely Yoshi, Luigi and Pikachu - have had their metagames developed in the years since the last matchup chart and are looking to be more dominant in the meta. His matchups against the higher-tier characters are looking to be more troubling due their increasing metas. This may result in DK having a worse matchup chart than originally thought. Iori - Took a set off of Overtriforce using Donkey Kong. Green Ranger - Often considered the best Donkey Kong in the world alongside Phish-It. Phish-It - Often considered the best Donkey Kong in the world alongside Green Ranger. Donkey Kong is currently ranked as 17th on the tier list in the E tier, making him a situational character in high-level tournament play. This tier placing, however, is significantly better than his initial tier placings; Donkey Kong was initially viewed as a low-to-bottom tiered character in the early Melee metagame, placing at 20th/21st with Roy on the first tier list. In future tier lists, Donkey Kong would frequently appear at this rank, with his lowest ranking being 22nd on the sixth tier list. Much like Bowser, Donkey Kong was often derided for his large hurtbox and high falling speed, making him an easy target for combos and attacks in general, and despite his slightly better base speed than Bowser, he was regarded as too slow to keep up with many characters that were higher-tiered than him. Devoted Donkey Kong mains, however, began to immediately improve Donkey Kong's metagame, notably by demonstrating that Donkey Kong's supposed speed issues were incorrect; it was demonstrated that Donkey Kong had a surprisingly fast and powerful aerial game, and that his dash-dance was also effective, especially when compounded with his throwing game. As a result of these improvements, Donkey Kong immediately jumped to the 16th place on the seventh tier list, and he ultimately peaked at the 13th position on the ninth tier list. His tier ranking, however, slightly fell following this, leading to his current tier placing. Donkey Kong's few active mains, namely Phish-It and Green Ranger, perform excellently at local tournaments, but suffer lower placements in majors. Donkey Kong appears in a one-on-one, as an ally, on a team with Fox, in a giant battle, in a multi-man battle, or in the metal battle. Donkey Kong appears in Kongo Jungle or Jungle Japes except the metal battle, where he appears in Battlefield instead. Donkey Kong appears in Stage 2 of Melee's Adventure Mode, Kongo Jungle, in two parts. In the first part, the player battles two tiny Donkey Kongs on Kongo Jungle stage and after they are beaten, the player will battle a giant Donkey Kong on Jungle Japes. Donkey Kong and his allies are fought on Kongo Jungle. Event 2: Lord of the Jungle: As a giant DK, the player must defeat a tiny DK in a two-stock match on Kongo Jungle. Event 10: All-Star Match 1: Donkey Kong is the second opponent to be fought in this series of staged battles. The player battles him on Jungle Japes, which will transition to the next stage if Donkey Kong gets defeated. With a timer of four minutes, the player must defeat him along with Mario, Yoshi, Peach, and Bowser. Event 13: Yoshi's Egg: As Yoshi, the player must protect a Yoshi Egg from Fox, Pikachu, and Donkey Kong for 55 seconds on Rainbow Cruise. If the egg breaks, the match will result in a failure. Event 25: Gargantuans: A scenario designed as a homage to kaiju movies and their various tropes. On the Fourside stage with unlimited time, the player plays as a giant-sized Bowser (symbolically representing Godzilla, a movie monster from Japan) with 1 stock against a giant-sized Donkey Kong (symbolically representing King Kong, a movie monster from the United States) with two stock. Two other characters on the match are a tiny Mario and a tiny Peach, who can be KOed within seconds by either Donkey Kong or Bowser. While he now prefers the laid-back jungle lifestyle to construction site mischief, DK is often forced back into action by the Kremling Krew. The great ape is quite fast despite his burly physique, and he keeps his strength up with a steady diet of his favorite food: bananas. His one extravagance (and only piece of clothing) is a monogrammed necktie. Donkey Kong is a huge target in a fight, so he hates crowds. When he's in the fray, his Giant Punch deals serious damage to multiple opponents. The big ape's Headbutt hits so hard that it temporarily buries opponent's in the ground. DK is a lot faster than he looks, and he's lethal in the hands of a master. Being the strongest simian around, DK has the upper hand once he grabs an opponent. He can even lift his foe up and make him or her an unwilling traveling companion; if DK grabs you, shake your Control Stick as fast as you can to break his grip. His Spinning Kong covers more lateral distance than vertical, so use it quickly to recover. Donkey Kong jumping on Jungle Japes. Donkey Kong attacking Fox on Temple with Spinning Kong. Donkey Kong attacking Link on Brinstar with Giant Punch. Donkey Kong carrying Nana off the stage on Temple. Donkey Kong burying Samus on Temple with his Headbutt. Donkey Kong taunting alongside Bowser and Captain Falcon on Yoshi's Story. Donkey Kong abusing Pikachu's AI. 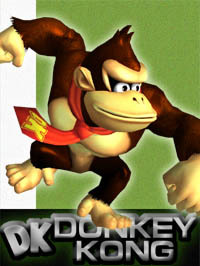 DK has a hurtbox attached to his necktie, which may have been placed to prevent thin projectiles or other similar attacks from missing hits due to their chances of slipping between DK's arms and ending in the empty space of his standing animation. However, it also artificially inflates his overall hurtbox in many other animations. Donkey Kong is the only character in the game to have an aerial attack that cannot be auto-canceled, being his forward aerial (auto-cancels on frame 85, but only has 60 frames in its entire attack duration). However, the coding of the move shows that it was intended to be able to, but it cannot due to a minor error caused by using the wrong type of timing function. Likewise, his up smash was supposed to interrupt on frame 40, but due to using the wrong type of timing function, it lacks IASA frames. Both of these errors were carried over in Brawl and SSB4, though in SSB4, his up smash now has IASA frames (interrupts on frame 50). Donkey Kong's Headbutt and the Poké Ball Pokémon Togepi's Magnitude are the only attacks in Melee that can bury opponents. Donkey Kong has 3 meteor smashes, more than any other character in Melee. Donkey Kong and Peach are the only characters in Melee who cannot use their down special in the air. When Melee was in development, Donkey Kong was planned to use voice clips from Donkey Kong 64 instead of reusing clips from the previous game. 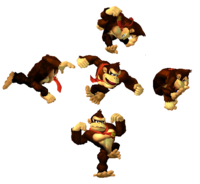 Whenever Donkey Kong enters the stage on certain modes in 1-P Mode (excluding Classic Mode, Adventure Mode, Event matches, and the first stage in All-Star Mode), he can be seen briefly in his bind pose position. If the damage ratio of a match is 0.5, and DK grabs, throws, and quickly re-grabs, and cargo carries a CPU before it touches the ground, the CPU will never break free by itself, even if it becomes invincible; they can only break free when DK decides to throw them or the CPU is affected by something (getting attacked, changing size, and so on). Melee marks the final game that Donkey Kong is the sole representative of the Donkey Kong universe. This page was last edited on April 20, 2019, at 05:55.